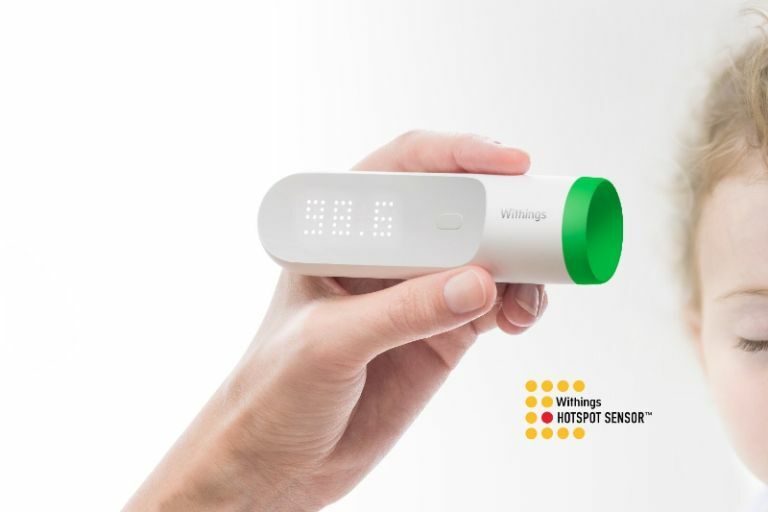 French electronics manufacturer Withings has been making waves at CES 2016 with its new Thermos product - a temporal artery thermometer that can capture accurate temperature readings and transmit them instantly via Wi-Fi. The simple-looking design has already been honoured with two Innovation Awards at this year's show and Withings is hoping to revolutionise the health tech industry forever. Rather than taking your temp from a point on your chest, neck or back, the Thermo takes its reading from the side of the head. Considered to be the optimum point on the body for measuring body temperature, the Thermo can gather up to 4,000 measurements in under two seconds. The device uses 16 seperate infrared sensors to gather all this data, which is then beamed direct to your tablet or smartphone via Wi-Fi or Bluetooth. "We invented the first Wi-Fi connected health device, Withings' smart scale, to enable users seamless access to their data to take control of their weight," says Withings CEO Cédric Hutchings. "Withings Thermo was designed to have a similar impact on the family's health routine. "The Withings Thermos will be available sometime in Q1 of this year, with an MSRP of $99 (around £67 or so). It will also come with a bespoke companion app designed for both Android and iOS devices. For all the latest news, updates and hands-on previews direct from the CES 2016 show floor, T3 has you covered.